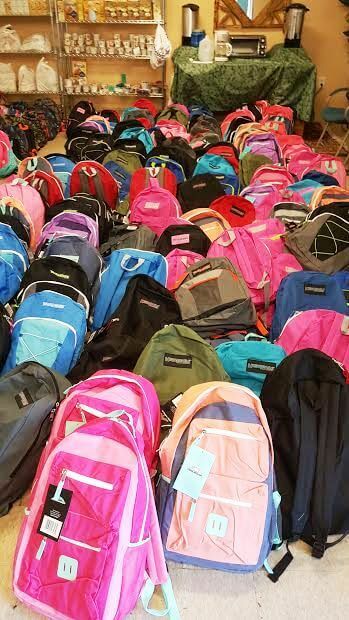 Last night, Nazareth’s College’s Dr. Muhammad Shafiq, Executive Director of the Hickey Center for Interfaith Studies and Dialogue, alerted me that the Barakah Muslim Charity Center on 452 North Street was offering backpacks on Saturday to all children in the Rochester community. Of course, I went with pleasure. Dr. Shafiq and his students have contributed to the magazine from its beginning and Dr. Shafiq’s story suggestions are always on the mark. 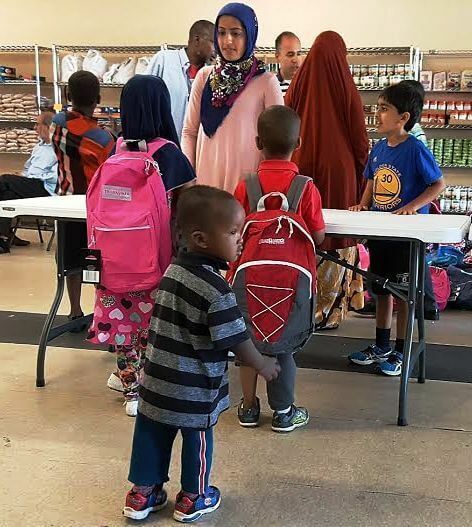 Barakah Muslim Charity hosts mobile pantries and food distributions, sponsors food drives, clothing drives, school backpack drives, toy drives, Ramadan food basket distributions, medical screening clinics, Milati Islam (addiction recovery) services, and refugee relief services. Barakah also offers Zakat distribution and private consultations for needy individuals and families in regards to food, clothing, housing and other necessities. 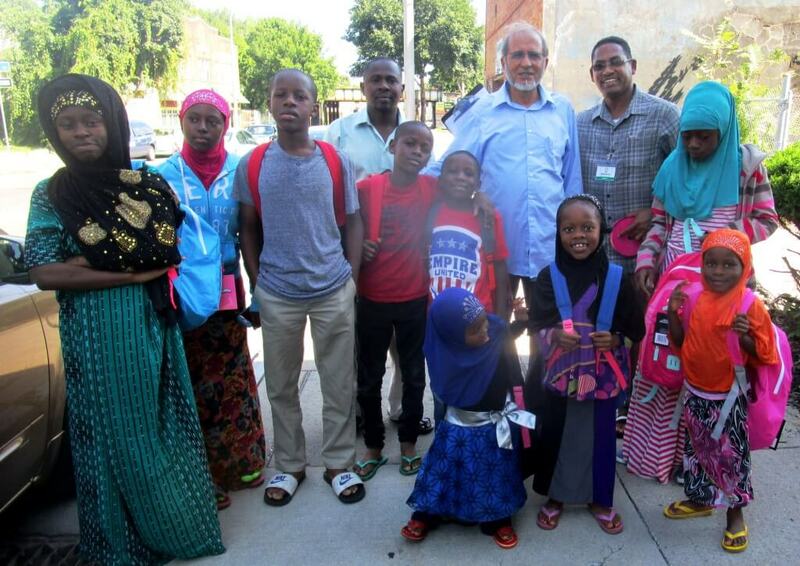 Upon my arrival on this sparkling late summer afternoon, Dr. Shafiq and other volunteers were greeting the several hundred families and children who had come from near and far. Dr. Shafiq was quick to say the event attracted people from just about every community in Rochester. 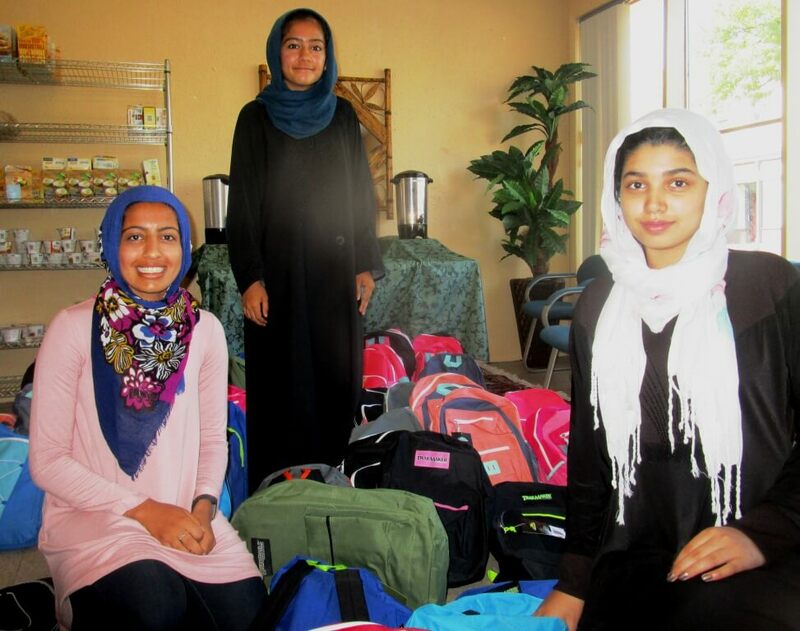 Three of the volunteers were high school students: Maryam Zafar (grade 12, Pittsford Mendon); Zainab Shah (grade 11, Pittsford Mendon) and Sanya Akber (grade 12, Brighton). Members of a Muslim youth group, the bright-eyed enthusiastic girls clearly took pleasure in handing out the packpacks. The trio also enjoyed our attempt at what we called an artistic backpack fashion show photo op. Trump’s presidential campaign is a hot topic in school. Trump’s call to temporarily ban Muslims from entering the country generated lively debate in Sanya’s U.S. History class. The class discussed the history of U.S. immigration policies, the constitutionality of Trumps’ proposal and — stressed by Sanya — its moral validity. I was also reminded of the many window stickers seen all around town. I spoke at some length with Barakah Muslim Charity’s President Irshad Altheimer, also Associate Professor and Deputy Director of the Center for Public Safety Initiatives at RIT. Irshad estimates the very diverse local Muslim community numbers about 10,000 of whom approximately 10% are African-Americans. 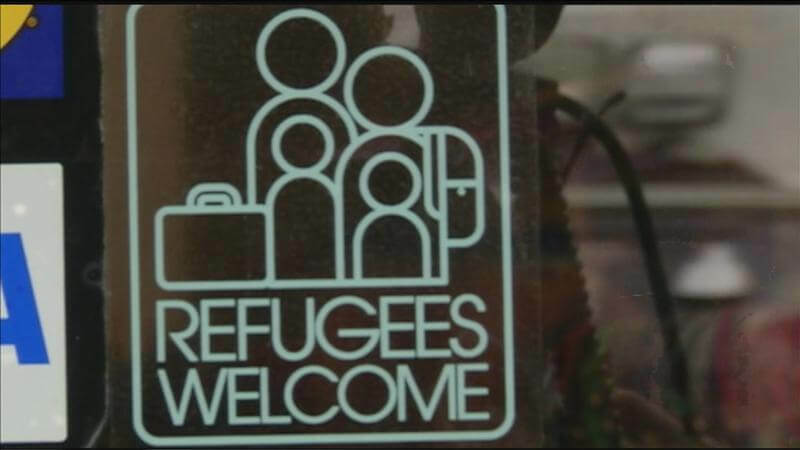 Spread throughout Monroe County — with many refugees living in the city — there is really no definable Muslim enclave or neighborhood. Irshad was not hesitant to discuss the current political situation. In 2000, Muslims voted for George W. Bush in large numbers. But — not surprisingly — Irshad sees scant support for Trump. Irshad thinks Trump’s anti-Muslim and anti-immigrant rhetoric has fostered a climate of fear and intimidation. Trumps’ critique of Khazir Khan was dismaying. (see Khizr Khan’s DNC Speech Addressed the Soul of a Nation) But, more so, Irshad and others found Trump’ call for the temporary ban appalling. Trump’ recent fire and brimstone speech on “severe vetting” was just more of the same. We also discussed some perceptions of the Muslim community. I mentioned that in the RCSD I too often hear young people use the term or pronunciation “A-rab” [in reference to all Muslims]. Given that Muslim people don’t refer to themselves as “A-rabs,” Irshad feels the name is disparaging, but one usually borne of ignorance. Irshad offered a telling anecdote. Once when approaching his mosque, three young African-American boys asked Irshad, also African-American, “Mister, why are you going into that mosque? It’s only for A-rabs.” Irshad said the mosque is for anyone and everyone, sitting down with the boys and explaining the diversity within the Islamic faith and that many Arabs are Christians. 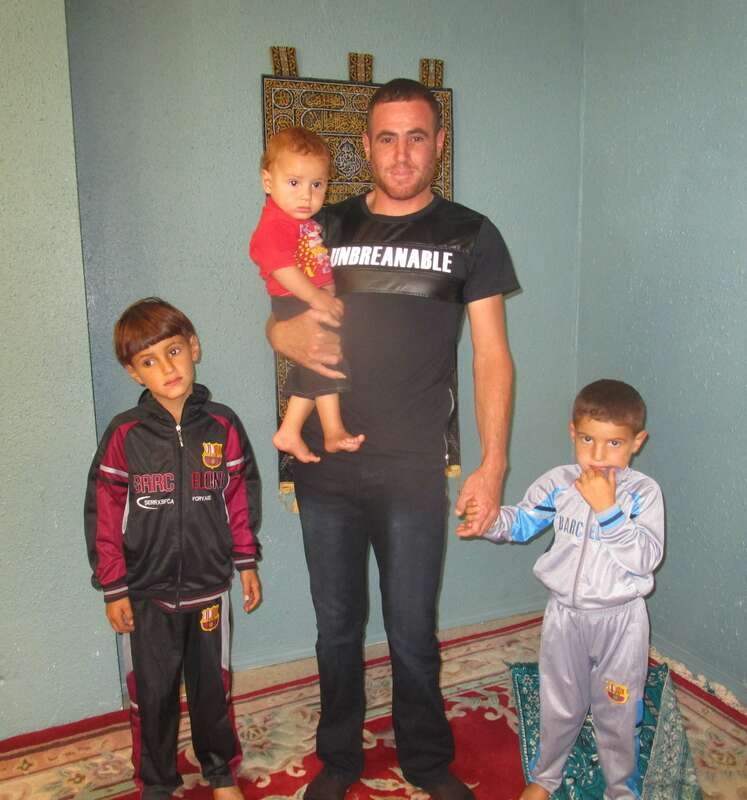 Teaching the boys (who were only repeating what they heard) why Muslims — or Christian Arabs — don’t like being called A-rabs, Irshad remembers the conversation as very positive. At one point, Irshad had said Rochester Muslims are “making history as we go.” I wondered if he had heard of Mohammad Ali’s famous visit in 1967 when he spoke at Muhammad’s Mosque on 416 North Street, just down the street from where we stood. 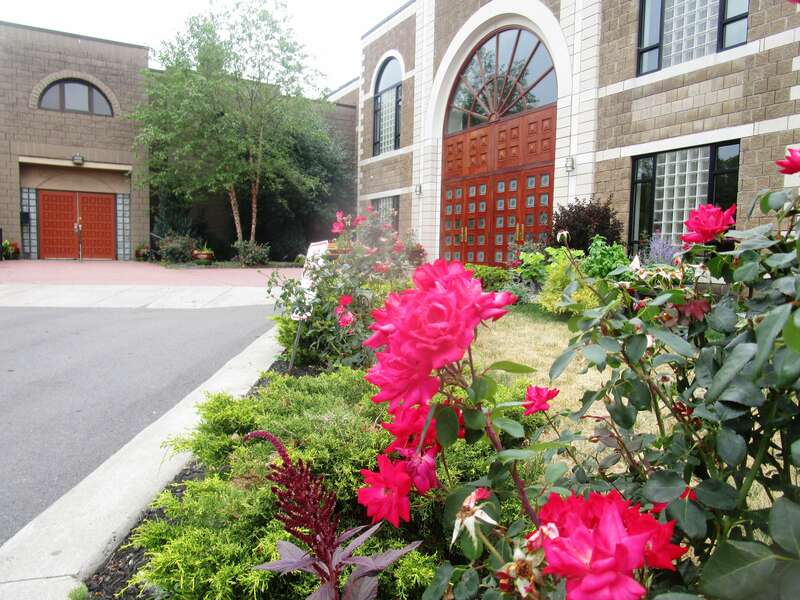 Having lived in Rochester for only 4 years, Irshad had not. And 1967 was way before he was even born! Irshad did say Ali is much revered within the Muslim and African-American communities. Thinking about Ali, Irshad added that you can call Ali a great Muslim American, a great African-American, a great Muslim African-American. To Irshad, the terms are interchangeable. Or better yet, just call Ali a great man, without reference to nationality, race or religion. When I left Barakah Muslim Charity, I felt as I do on my occasional visits to the Islamic Center on Westfall Road in Brighton. Entirely welcomed. And shaking my head that some people think Muslims don’t belong in their own country.